California Senior Care: Back to School Vaccinations Aren’t Just for Kids! As summer winds down, parents are busy shopping for school supplies, checking last year’s clothing to see what still fits, scheduling appointments for physical and dental exams, and more often than not, subjecting their children to vaccinations. But fall isn’t just the time for school kids to roll up their sleeves for the dreaded shots. This time of year, even adults should get in on the act, including seniors over age 60. According to this report from the Centers for Disease Control (CDC), adults over the age of 60 should be up to date on the following vaccinations; and if your senior loved one needs a booster, our California senior care services can help! As one ages, the body’s natural immune system becomes weaker, which puts older adults at a higher risk for catching viruses such as the flu and pneumonia. In fact, influenza and pneumonia together are the seventh leading cause of death for people over the age of 65 in the United States. Appropriately vaccinating against these diseases can ward off, or at least reduce the severity of these viruses, which can save lives. For many seniors, it has been a very long time since they were last vaccinated for tetanus, diphtheria, or pertussis. This vaccination, also called the DTaP, should be boosted with another shot every ten years. Finally, even if you received the chickenpox vaccine as a child, and whether or not you actually contracted the virus as a child, as an adult you still need to get the shingles, or herpes zoster vaccine, as the virus can present in a more painful and harmful way in later life. The risk of developing shingles also increases as we age, with half of the cases occurring in both men and women over age 60. 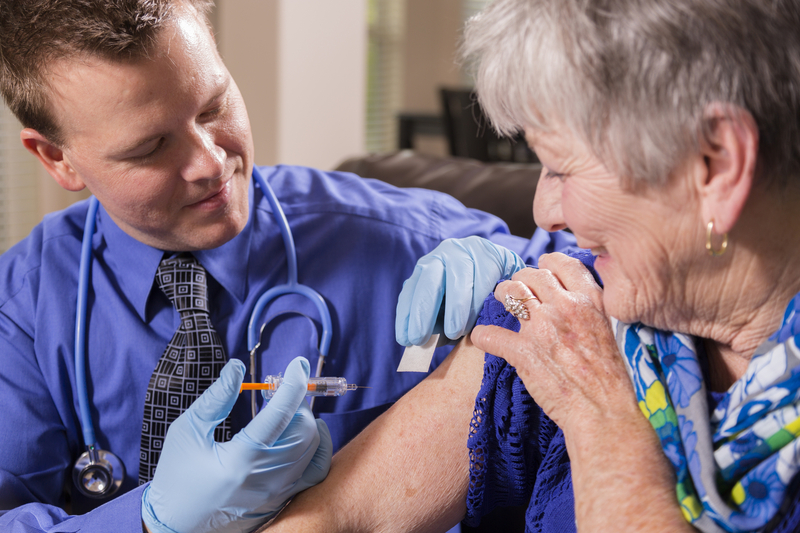 The CDC offers a free, downloadable Adult Immunization Scheduler so that older adults and their family members can keep track of the vaccinations that are needed as they age. As a part of our California senior care services, Hired Hands Homecare can help to encourage and facilitate proper vaccinations with transportation and accompaniment services to the doctor’s office, pharmacy, or other location. To learn more, contact us at 866-940-4343.